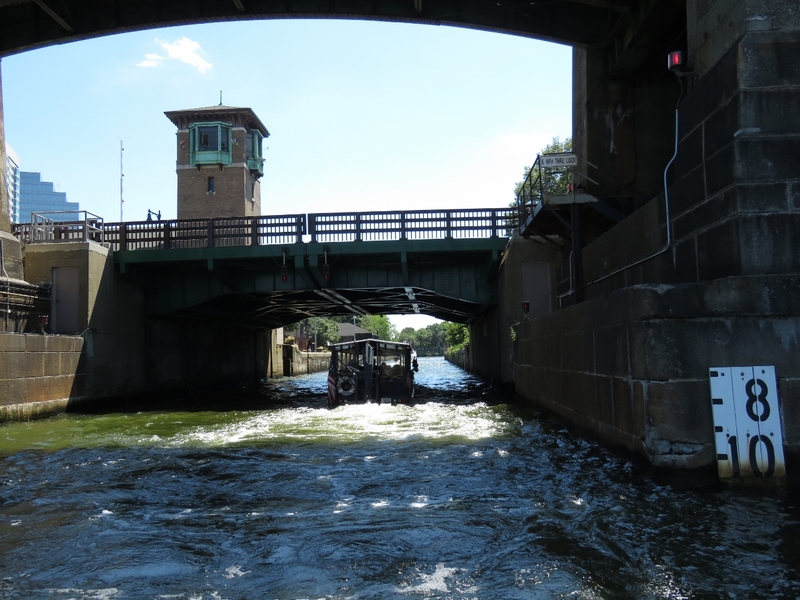 The Charles River forms the border between downtown Boston, and Cambrdige and Charlestown. The famously polluted river was mocked in the Standell’s 1965 hit single “Dirty Water”: “Down by the banks of the river Charles … Well I love that dirty water Oh, Boston, you’re my home.” Swimming was banned in the river in the 1950s due to high pollution levels. 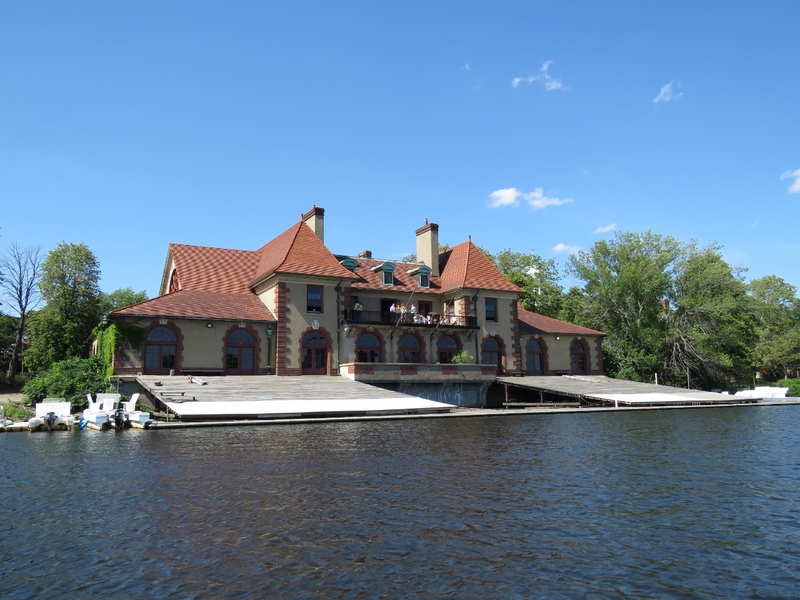 But in July of 2013, after years of conservation efforts, public swimming finally was allowed again. 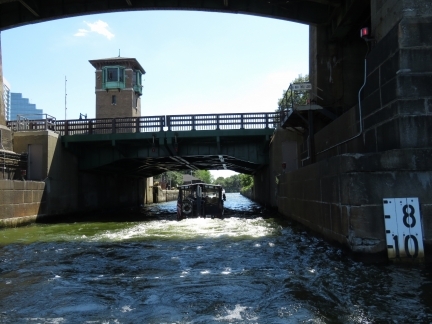 After completing a few boat projects, we ran the tender through the locks to explore the Charles River and check out the July 4th festivities. Hundreds of boats were at anchor near the mouth and people filled the shores, with a constant stream of new arrivals, to watch the fireworks that would be launched just upriver. Testing out the new digital HD TV antenna. We could use our satellite dish, but the services available are fairly expensive for how little TV we watch. The antenna seems to work well and brings in a clear, crisp picture. 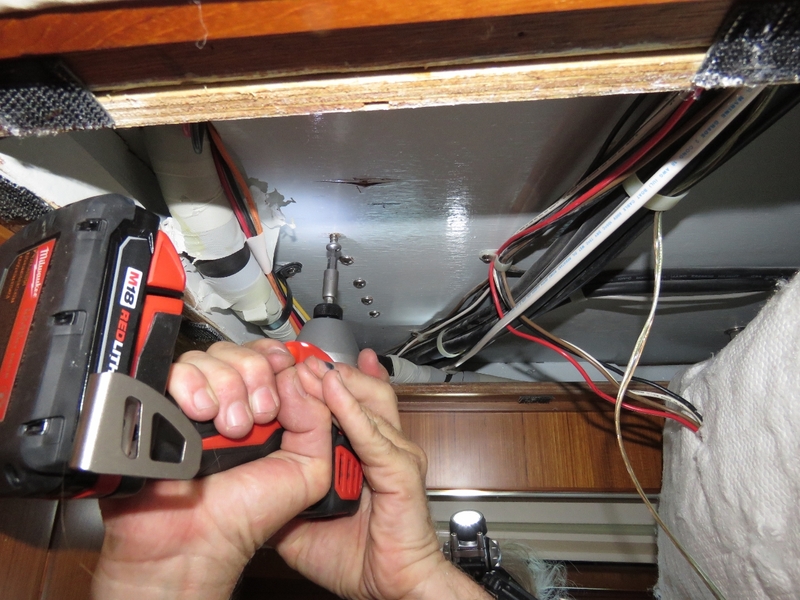 One of the supports for the 250-pound isolation transformer under the pilothouse settee broke off and the unit was sitting at an angle (we suspect this may have occurred during the 69° roll). 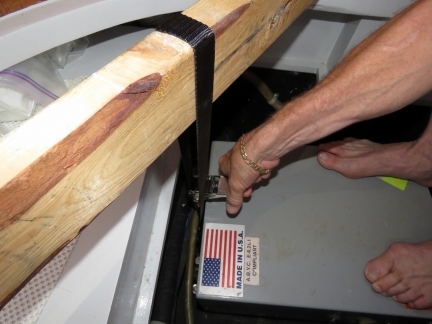 James devised a hoist using a 2-by-4 and a ratchet strap to raise the transformer above level so we could fabricate a new mount and lower it back down. Attaching the new transformer mount from the stateroom below it. 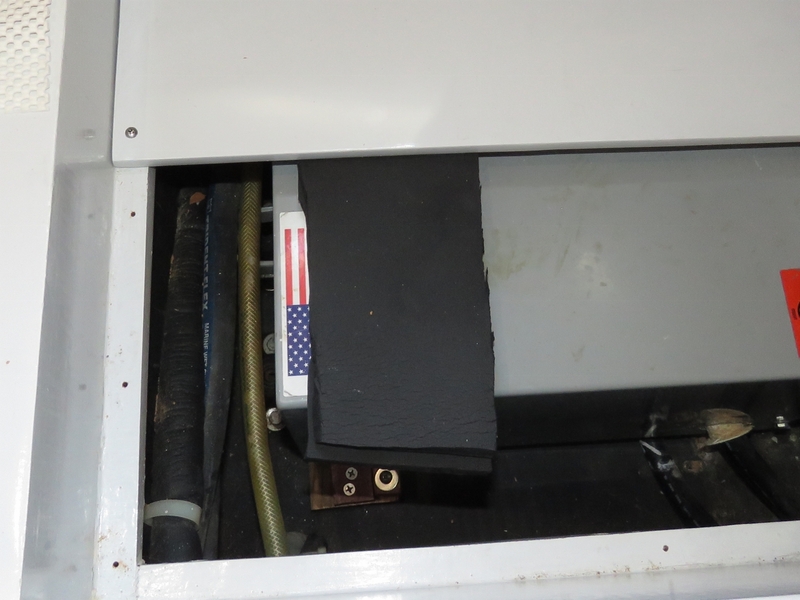 Now that the transformer is returned to securely mounted and level, we put one extra level of protection in by screwing the panels in above it so the transformer can’t twist and damage the mounts even in the unlikely event of another severe rollover. 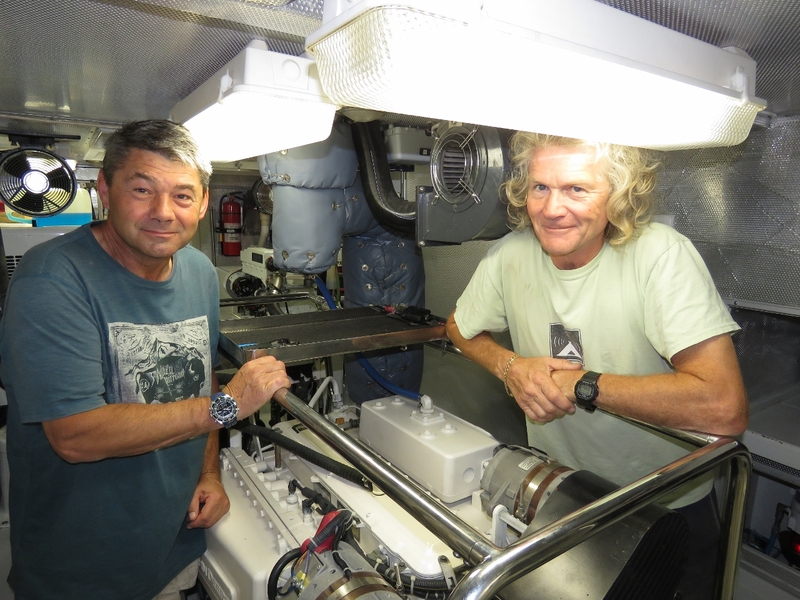 UK-based commercial pilot John Bosden had missed us by a couple of days in Cape Town, Barbados and St. Lucia, but managed to catch up with us Boston. 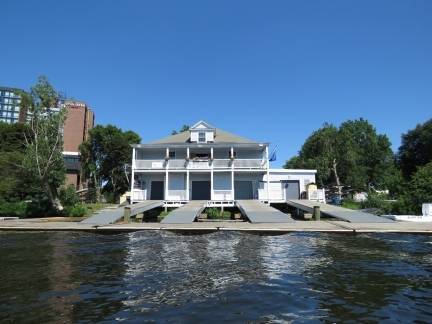 We hope to be visiting his home country in Dirona in a year or two. In the lock to pass through the Gridley Dam on the Charles River. Passing under the Charles River Bridge that carries commuter rail. 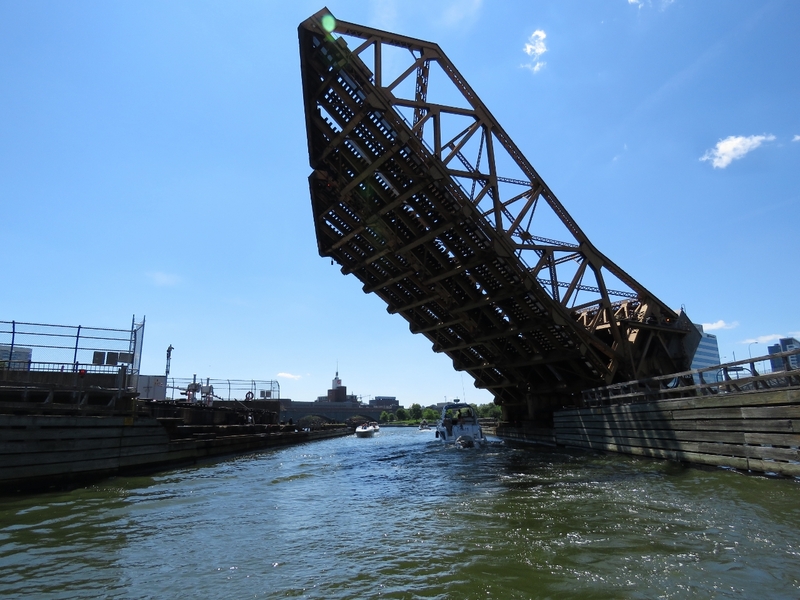 The original lock for the Charles River was located just beyond the Craigie Bridge that we’re about to pass under. 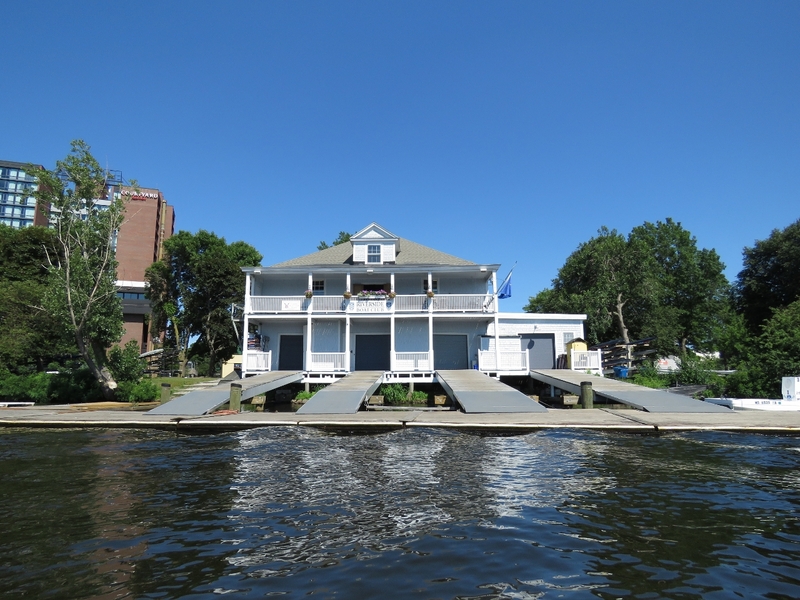 The dam and lock were relocated further east in the late 1970s because the older dam, built in 1912, could not keep sea water out and a layer of salt water had accumulated at the bottom of the fresh water basin, contributing to pollution and fish migration problems. 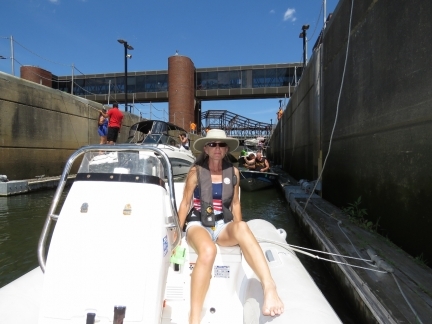 The former lock, visible in the distance, is kept open to allow water and small boats to pass freely. 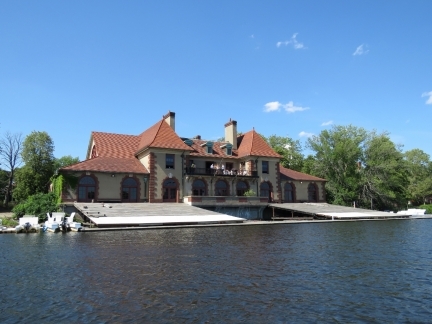 The Museum of Science was built on the old dam and adjacent piers. 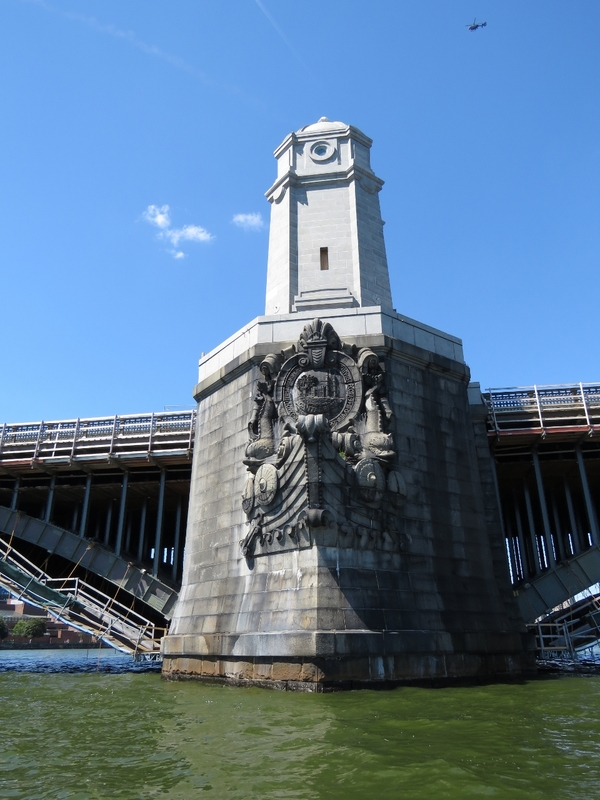 The ornate piers of the Longfellow Bridge, completed in 1906, are sculpted to represent the brows of Viking ships reflecting a purported voyage up the Charles River by Viking Leif Eriksson around 1000 AD. The bridge is named after Henry Wadsworth Longfellow whose poem “The Bridge” was about it’s predecessor, West Boston Bridge. 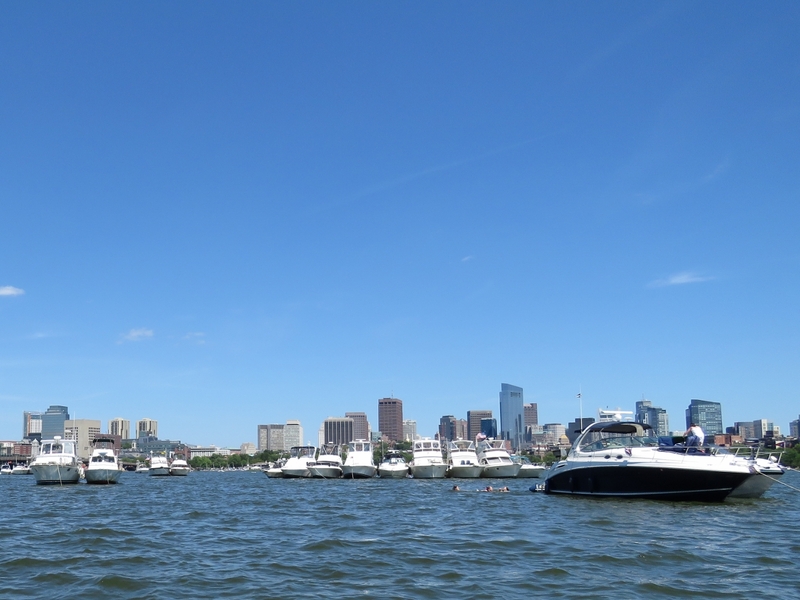 Hundreds of boats were at anchor along the Charles River, with a constant stream of new arrivals, to watch the July 4th fireworks that would be launched just upriver. 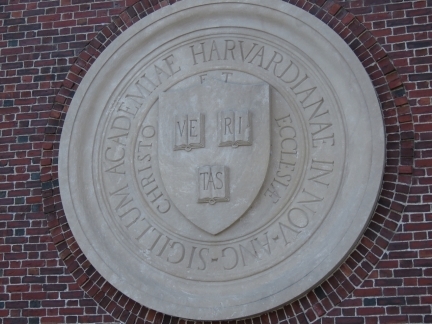 Harvard University seal on the John W. Weeks Bridge that connects Harvard Business School’s newer Allston campus and the Business School’s former home, Harvard’s traditional campus in Cambridge. The Latin motto “VERITAS” (“Verity” or “Truth”) is at the center. 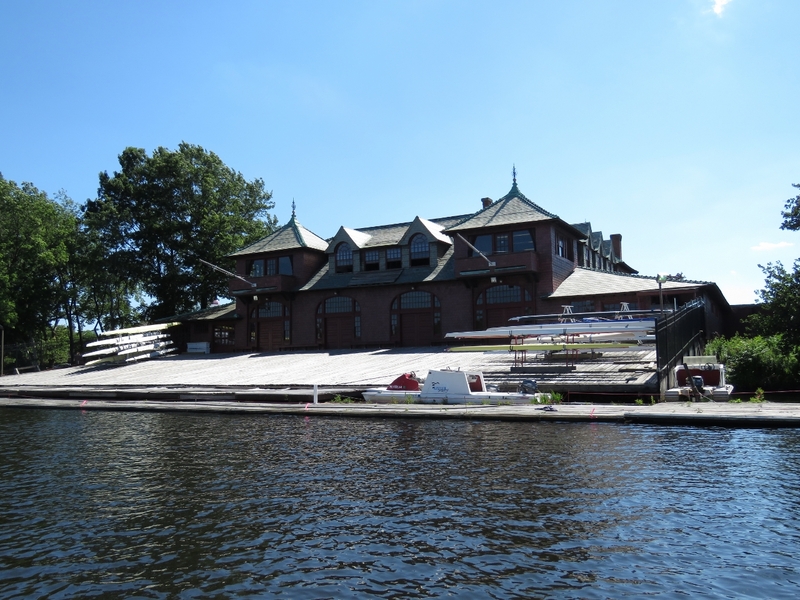 The Weld Boathouse, built in 1906, is the home of Harvard’s women’s rowing team. Newell Boathouse was built in 1900 and is the home of the Harvard men’s rowing team. 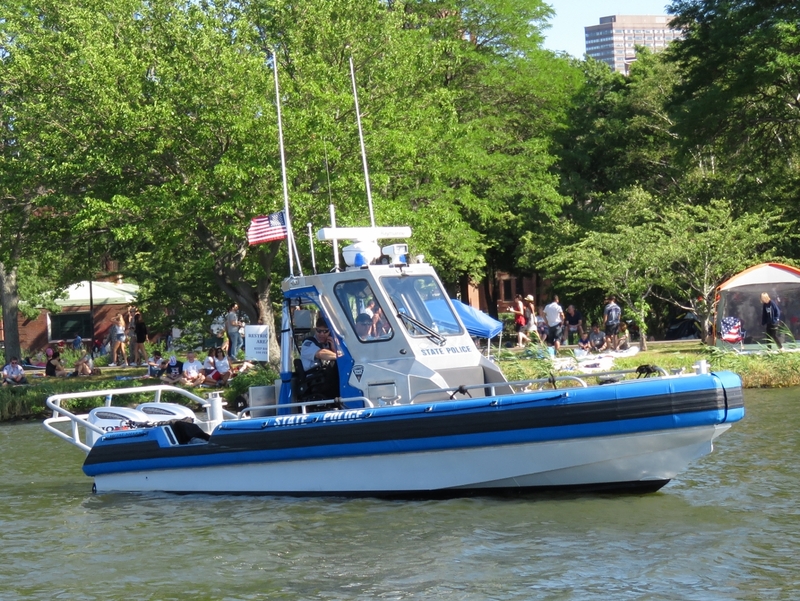 We’re always on the lookout for Metal Shark boats and spotted one here belonging to the State Police. An incredible number and variety of law enforcement vessels were out patrolling the waters, including Coast Guard, various fire and police departments, and the National Park Service Environmental Police. 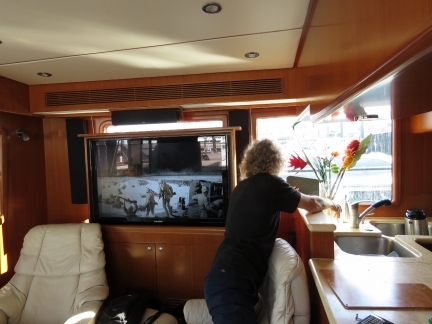 There was easily ten times as many enforcement vessels for a quarter of the pleasure craft as compared to the Poulsbo, WA fireworks display we watched in 2011. A huge American flag at Rowe’s Wharf in Boston Harbor after we’d returned back out through the lock. 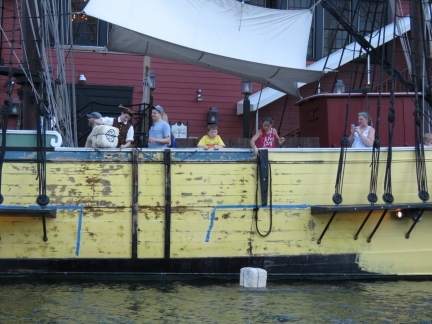 Tour attendees at the Boston Tea Party Ships and Museum re-enacting the famous act of protest against Britain’s tax on tea. In December of 1773, the Sons of Liberty boarded the ships of the East India Company and threw an entire shipment of tea into the sea. 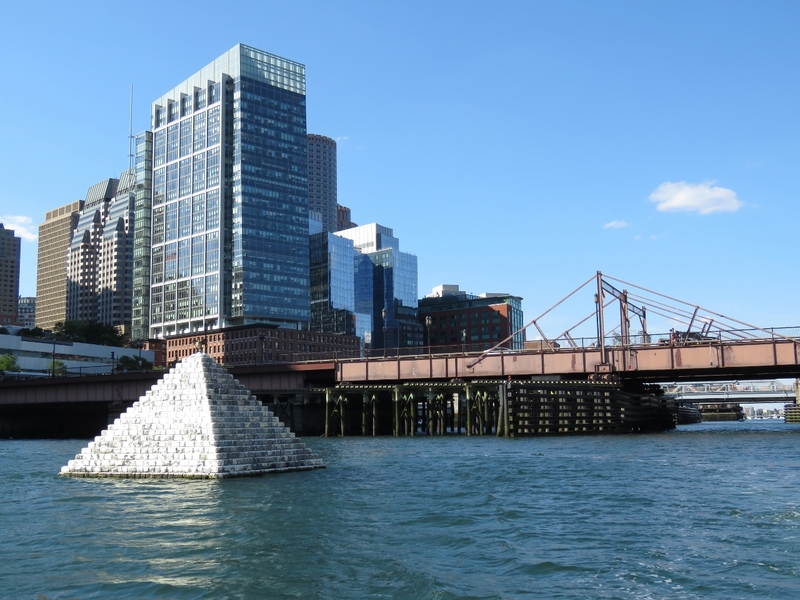 This floating pyramid, called “Pyr 2014” is a project of the Fort Point Arts Community. Built by designer Don Eyles, the pyramid is made of polystyrene to resemble the cobblestones that live beneath the now-paved Boston streets. 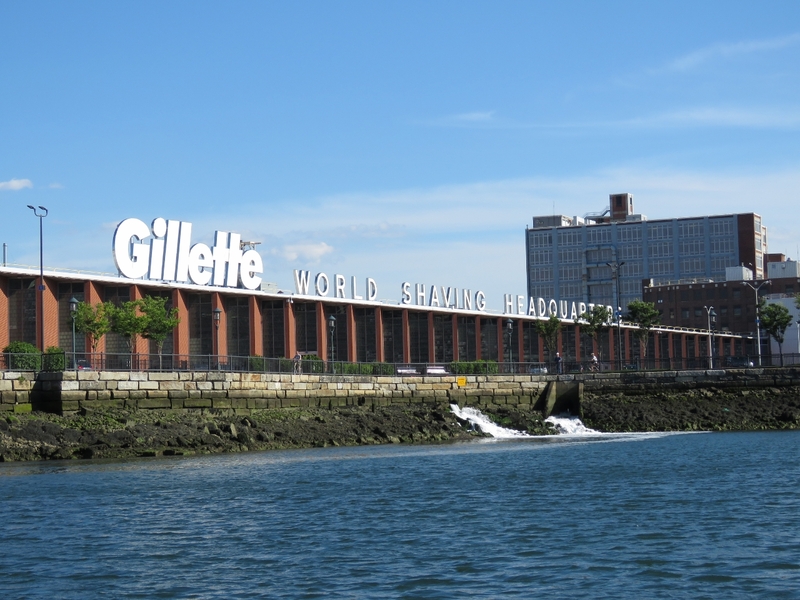 The Gillette World Shaving Headquarters building along Fort Point Channel in South Boston. 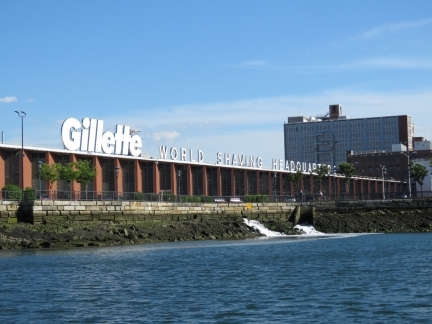 Gillette blades have been made in Boston since 1905. 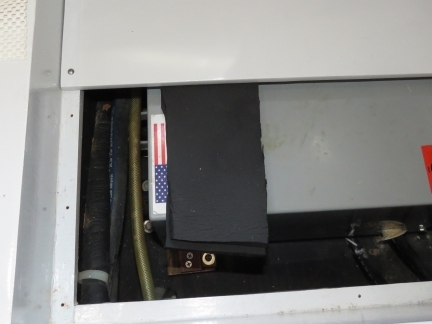 While the company has expanded production globally, they continue to manufacture their best blades here. 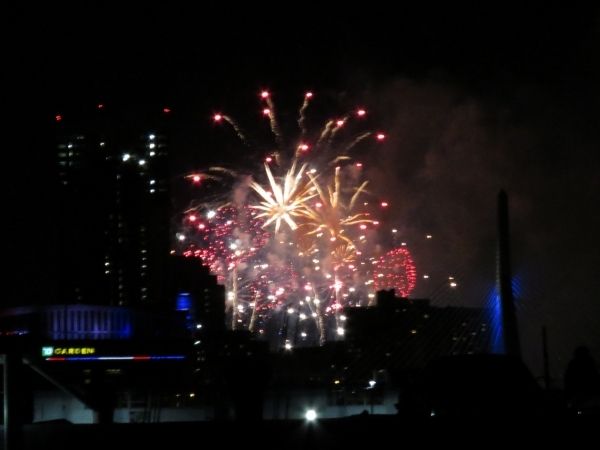 The July 4th Fireworks display over the Charles River was spectacular: https://youtu.be/ndr2turtzJk. We couldn’t see the display from the marina, so we ran the tender just around the corner for a great view. This might be the last year for Boston’s July 4th fireworks, one of the nation’s signature Independence Day celebrations. 77-year-old businessman and philanthropist David Mugar is stepping down after privately funding the event for 43 years. Unless the weather changes, we are probably out of time in Boston and will be getting underway for Canada sometime over the next couple of days. 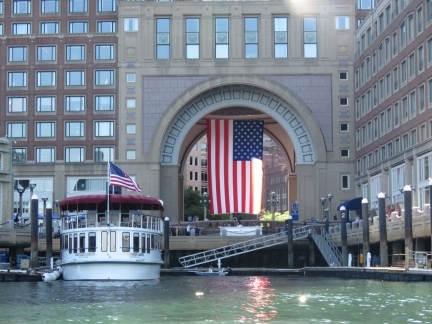 We have had a great time in Boston. 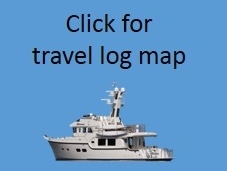 Thanks for the tips on places to see.